So I attended my first real Halloween party last week, getting into the spirit and donning a costume. 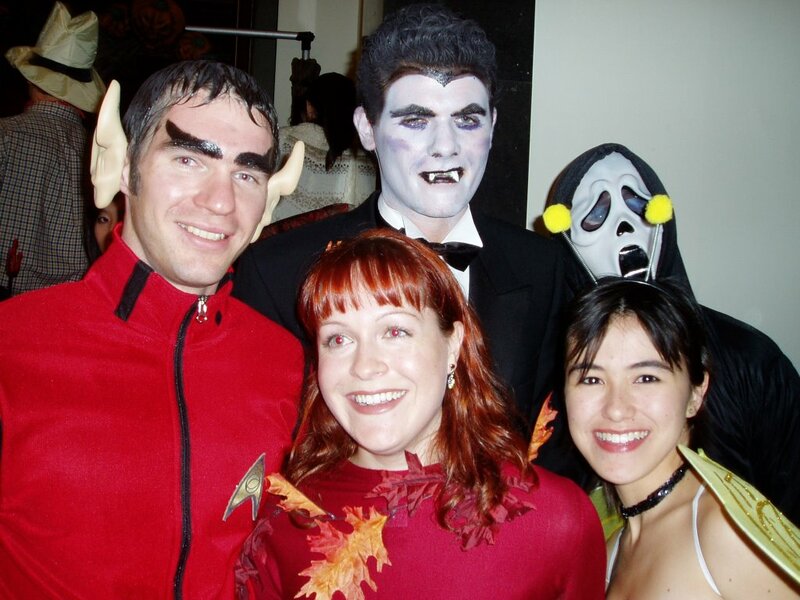 You can see who I was from the photo above, where I'm accompanied by Winter, Vampire, Scream and Bumble Bee. Check out the rest of my photos to see how other people dressed-up. Prizes for the most creative costumes, in my view, would have gone to the Asian Bird Flu, White Trash and the Freudian Slip (you'll have to view the photos to see how she made that costume). There's no doubt that people go all out at Halloween over here. Almost everyone at the party had pulled together some kind of costume. It was a law school event, meaning there were probably 1000 people there, so we're not talking just a few costumes. I went into a costume shop a week before the day itself (31 October) and it was PACKED. Packed with wall-to-wall merchandise, and packed with people buying it. The whole thing must add a couple of billion dollars to America's GDP. Once you take into account costume manufacture and distribution, retail, advertising, candy sales for the trick-and-treaters, alcohol sales for all the parties, health costs of all the party injuries, and the second-hand costume trade (because nobody wheres their costumes twice), there's a lot of money swirling around Halloween. reviewers and reviewers are not the only things to consider. mmm, your eyebrows are fabulous but it's the fringe that clinches it. I have a airbrushed teesTee site called Holden Tees. We're a small company and we sell shirts and stuff.